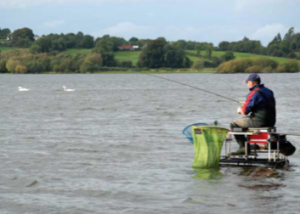 Corfree Shore is among the most consistent fisheries in Cavan. Providing there is a touch of breeze on the water, there is a good chance of catch bream (around the second style is a good spot) and the roach and hybrids are everywhere. Matchmen tend to dump a good helping of groundbait at 40 metres before starting to pole fish at 12 metres, changing tactics after about 45 minutes to see if the bream have discovered the groundbait. There is new and improved access by car. Popular methods: Long pole for bream, groundbait feeder and waggler. Access: Access is first class with a new lane from the main road to the water’s edge. The most popular swims are to the right (when facing the water) but fish can be caught all along the stretch of bank. Directions: Arriving into Gowna Village from Cavan, turn right at the crossroads (the Post Office is on the right corner) and follow the road for 8/10ths of a mile. By this time you will be at the top of a small hill and the entrance is on your left, across a cattle grid and through the farmyard. There is no need to ask and anglers are welcome. Please respect the land.